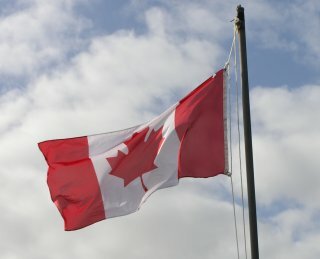 Canada has looked a much improved team compared with their 2005 International Cup, but their loss to Ireland left a question mark on how much they had improved. Although their opponents Japan are not one of the top sides, the Northwind did enough to show that they really are on the rise. 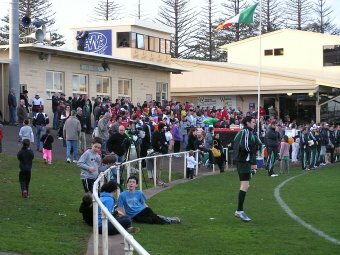 Very cold conditions and a cross-wind only slightly favouring one end greeted two traditionally red and white teams at 3pm on Walter Oval, Warrnambool. A crowd of around 50 - 100 fans showed up to watch the battle between two teams that are locked into finishing 5th to 8th. 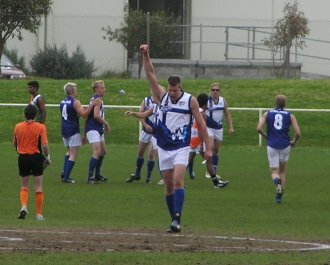 The jumper clash meant the Northwind wore their predominantly black strip. The Samurais kicked with a very slight advantage in the first but squandered their few opportunities in a sign of things to come - goal-less for the quarter.. The Canadians applied enough pressure to provide their own forwards with chances, and in what has become a very reliable double act, Falcioni and Fleming kicked one each in the first. The crowd at Warrnambool's Reid Oval was cold but buzzing as the 7:30pm clash between two time International Cup runners-up Papua New Guinea lined up against the rising force in international Australian football, South Africa. Both teams fielded 26 man squads (as possible by prior agreement between teams). The instant the game started it was clear that early predictions of a fast-paced game were accurate. Players from both sides sprinted into the contest, perhaps with more speed than wise when you need to get the footy too. Emmaus Wartovo registered the first score for PNG, booting a long ball from around 50m. Sylvester Mangoea led nicely and marked, but he too missed his shot. Overa Gibson was the first to regain his balance after a pack contest in the goalsquare and roved the ball for a snapped goal - the Mosquitoes were flying. South Africa's vice-captain Steven Malinga took a big mark but couldn't convert from a difficult angle, the kick sliding across the face and not scoring. A running goal to Zachary Rava meant the Papuan's were now getting value for the amount of ball they were getting. A bit of niggle threatened to break out between Desmond Waluka and Simphiwe Mbhalo - one shove, two, three, then suddenly they relaxed and patted each other on the back and re-focussed on the game. The US saw this as a danger game as Nauru have been the big improvers in this tournament, and rated highly by the opposition that they had already encountered. For the Nauruans this would be a great challenge and a great opportunity to take another scalp. The first minutes saw the customary full on scrap with high pressure and quick ball movement causing numerous turnovers with neither team able to put together a long string of possession. The US were the first to break the deadlock when Paul Duncan scored the first behind. The US had the breeze which was blowing from the south today. Just a quick note to all the fans out there to advise that we may struggle to get all our match reports for Round 4 (the first round of finals yesterday at Warrnambool) up today. There were evening games then the long trek back to Melbourne and then there's the Official Dinner tonight, then a full round of matches again on Friday. If any matches are missed a report will follow later. We can report that it is our intention (though not our promise) to have score by score coverage of the International Cup Grand Final from the MCG on Friday night. In the 1pm Reid Oval contest, Australian Football International Cup newcomers Finland and India got their best chance to register an inaugural win. It was the Finns that looked the goods, but then got a second quarter scare before stabilising the game for a gallant victory in adversity. Coming into the tournament the Icebreakers had a fairly small squad of players - this has steadily deteriorated further, such that they started this match with just 18 men, some of whom were by no means in a fit state for footy. In fact in a remarkable scene Jani Saarinen took the field in what we think was protective eyewear, having allegedly had a night-time run in with a low tree branch the night before. 3pm, Mack Oval, Warrnambool, country Victoria. That was the unlikely setting for a brutal encounter between the islanders from Pacific Samoa and the Elks from European Sweden. And yet there was something very old style Australian football about this match. The skills on display varied from exciting to rudimentary, but one thing was guaranteed all day - a very physical contest. The Samoans ran head first into every clash with frightening vigour, but perhaps surprisingly, the Swedes showed true courage under fire and gave almost as good as they got. But alas after a slow start they couldn't never quite peg back the margin and will have to console themselves with the knowledge that they "stood up" in a fiercely contested match worthy of a bigger crowd. Please note this article is one we have just completed from the last remaining match in Round 3, not the just completed Round 4 first round finals matches. In the wake of South Africa defeating the US, and South Africa only defeating Denmark by 45 points we could only deduce that the Danes perhaps took a little while to get settled (having been comprehensively defeated by the US in their first match) and might just now be hitting their straps. The Chinese have put up a brave fight in their first two matches with big losses and it looked like they would need to be brave again today. The persistent wind seen in earlier matches kept up, though now pretty much across Reid oval the sun was shining as the match got underway. 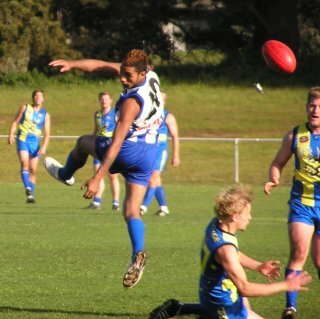 The Warrnambool leg of the 2008 International Cup has been completed, with New Zealand and Papua New Guinea securing a place in Friday's Grand Final. 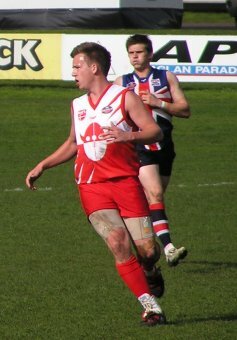 The match is a repeat of the 2005 Grand Final, with Papua New Guinea also partaking in the 2002 final against Ireland. As was expected, Round 4 provided much closer scorelines than the first three rounds, and whilst there were a few comfortable victories, there were no thrashings. Furthermore Finland and the Peace Team registered their first victories. 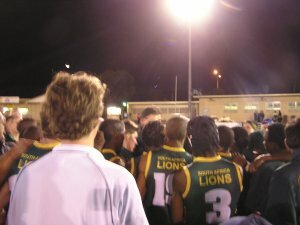 Friday concludes the 2008 International Cup. Apart from the Grand Final (curtain raiser to the Hawthorn vs Western Bulldogs AFL match at the MCG) classification matches will be held for the other teams to determine overall finishing positions and placings at future tournaments. The Post Courier, one of the major national newspapers in Papua New Guinea has already headlined the sports section with stories about the national Australian Rules Football team's International Cup campaign at least twice this week. Although the sport has had the occasional story in PNG media in the past and PNG has always been one of the better supported teams in the cup, the level of attention that the team is currently getting is unprecedented in the country. Today's front sports page ran the story "Mossies raring to sting". The article highlights the real threat that a much improved South Africa poses to the Mosquitos' International Cup campaign. Additionally, the weekend Courier published a story "Awesome foursome" profiling their exciting junior players Peter Labi, Amua Pirika, John Vogae and Emmanuel Tupia who at just 17 are all playing in the International Cup for the first time. People are obviously getting excited about the Mozzies in PNG and with this much press one would expect signficant interest in the country if the team can either make the Grand Final or win the International Cup. The intention is to update these scores each quarter as the games progress. Match reports and images will follow later. All times are Australian Eastern Standard Time (AEST), which is +10 GMT. The forecast is for a cool day, around 14 degrees Celsius, but fine after early fog. Partly cloudy with light to moderate southeasterly winds. The overnight low is then supposed to be zero degrees Celsius, so the evening will turn very cold very quickly - no need for ice baths for the players!